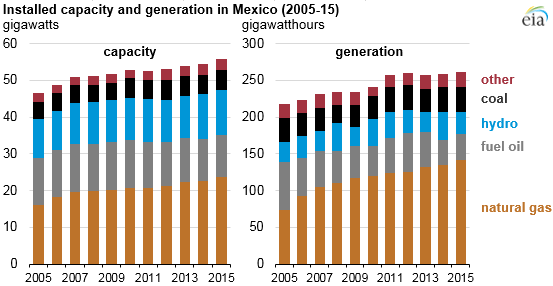 Natural gas is Mexico’s largest source of electricity generation, accounting for 54% of the country’s generation in 2015, up from 34% in 2005. According to Mexico’s national energy ministry (SENER), more than 60% of Mexico’s electric capacity additions between 2016 and 2020 are projected to come from natural gas-fired power plants, and significant natural gas capacity additions are expected to continue through 2029. SENER projects that natural gas-fired capacity will account for 24.9 gigawatts (GW) of total capacity additions from 2016 to 2029. The remainder of Mexico’s projected capacity additions are made up of renewables (20.4 GW) and nuclear (3.9 GW). The growth in natural gas-fired capacity is projected to accelerate sharply over the next four years, with SENER projecting that 14.7 GW of new gas-fired capacity will come online by 2020. New natural gas-fired capacity additions are planned to continue through 2029, replacing more than 15.9 GW of retiring capacity, of which most are plants fueled by coal and fuel oil. Most new natural gas-fired capacity additions will be located in the northern and central parts of the country. New natural gas-fired plants will greatly increase Mexico’s natural gas demand. SENER projects an increase in natural gas demand by the power generation sector from 3.6 billion cubic feet per day (Bcf/d) in 2015 to 5.4 Bcf/d in 2029. Expected demand growth will be met mainly by a combination of increasing imports of natural gas from the United States and by large expansions of both cross-border U.S.-Mexico pipeline capacity and Mexico’s domestic natural gas pipeline networks. Recent reforms in Mexico’s electricity sector are intended to open it to private investment and create a new wholesale power market to encourage development of cost-effective electric capacity, reduce high electricity costs, and transition Mexico’s generation fleet to cleaner fuels. Much of the new natural gas-fired capacity added in recent years replaced petroleum-fired capacity. More than 4.3 GW of fuel oil units were converted to natural gas by the end of 2016. Mexico’s Federal Electricity Commission is targeting a 90% reduction in the country’s fuel oil consumption for electricity generation between 2012 and 2018, leaving the remaining fuel oil power plants to serve as peaking units for reliability purposes. Most fuel oil plants will be retired, with 6.2 GW scheduled to be retired from 2016 to 2020 and another 4.7 GW from 2021 to 2029, according to SENER.